The launch of the High School social enterprise pocket book, encouraging a positive attitude to life. 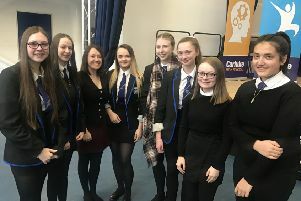 Carluke High School is showing just how far the scheme has come over those four decades by launching what is now termed a ‘social enterprise’ with the aim of making money to pay for the battle against mental illness. In fact, the very ‘product’ they are selling should help in that fight, being a mini-guide to how to overcome dark moods. The S3 business management class, under its teacher Linzi Goodwin, has launched an enterprise under the title People Inspiring Positivity. Ms. Goodwin explained: “The young people involved, Greg Allan, Sarah Allan, Ross Anderson, Brandon Duthart, Lorna Ferguson, Taylor Frame, Bethany Jacobs, Declan Miller, Tara Noon, Matthew Paton and Arron Weir, quickly decided they wanted to create a business aimed at helping those dealing with mental health. “From this they developed their idea for the Pocket Guide to Positivity. The book aims to spread positivity with the objective to raise money for mental health charities. “The team worked extremely hard to produce their book with the help of some pupils in the S3 deeper learning Graphics class, namely Nathan Christie, Kaiden McLaughlin, Emily Lothian and Abigail Taylor. “The launch took place in Carluke High School library, where the team gave a presentation to friends, family and local businesses. “Paula McGuire, author of Must Try Harder: Adventures in Anxiety (@pmudsttryharder), someone with her own experience of mental health challenges, wrote the foreword for the book. Paula gave an excellent speech in support of our young people and the project.